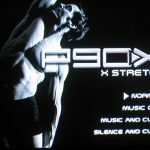 The X Stretch P90X workout was pretty straightforward and the stretches felt really good on my sore muscles. The Seated Spinal Stretch was somewhat difficult to get into (I felt like a pretzel), but everything else was pretty simple. I really enjoyed the stretches that worked my glutes (they are especially sore from P90X Legs and Back)! Today is going to be a hard day to maintain my P90X diet. My wife and I are leaving in about an hour to go to North Carolina to visit my grandmother (I call her Me Maw). Me Maw actually eats pretty healthy, but she always makes a ton of food like most grandmothers, and she expects me to eat a lot of it since I’m a guy. She’ll say, “Jonathan, go ahead and get some of this or this,” or “Jonathan, aren’t you going to get some more?” She makes me feel like I have to eat a lot. She also has to make me some type of pie when I come (usually chocolate pie since it’s my favorite). I of course can’t turn a piece down because she made it especially for me and I don’t want to insult her or upset her. I love my grandmother to death, and I know she is really just trying to show me that she loves me through her cooking. We’re coming back on Sunday around noon so it really won’t be that many meals that we have to eat with her. Well, I’ve got to go pack and get the car loaded up! If you’re doing P90X, keep up the awesome work! !